Before you can start any new job search, you’re going to need to update your resume. It’s still the most important document in the job search process and is the item that recruiters and hiring managers rely on the most when they’re deciding if you end up in the yes or no pile (a digital pile of course) for a specific job. 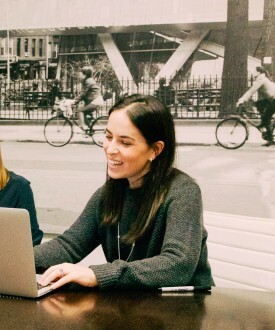 The resume is one of the first things I tackle with my clients and there are a few main items I consider to help them put their best foot forward. 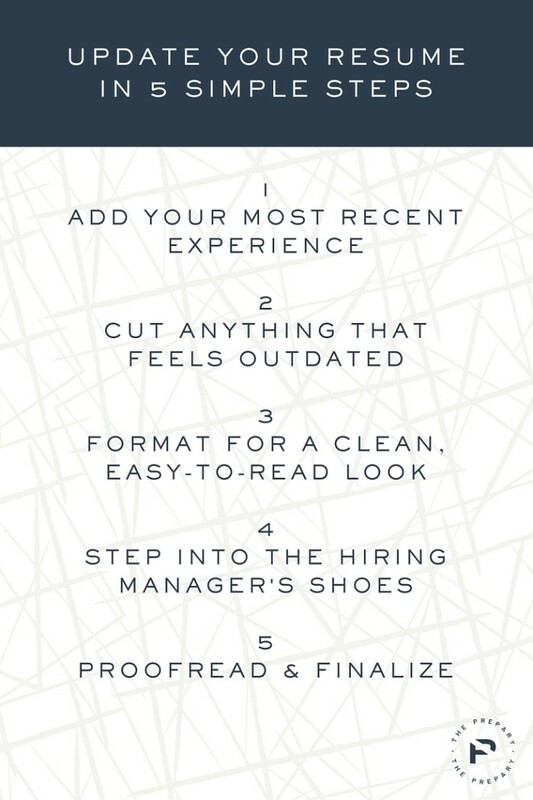 Here is a 5-step checklist you can use too as you’re updating your own resume. First thing’s first. You need to update your resume with your most recent experience. IF your most recent job is relevant to what you want to do next, it will likely take up the most space on the resume and have 4-6 bullets devoted to it. Make a laundry list of every task you do in your current (or most recent) job. Don’t think too hard about the wording. Just get the actual work you do on paper. Out of all of the tasks you wrote down put stars next to 4-6 that are resume-worthy. The ones you select should combine your most impressive responsibilities or projects and ones that are most relevant to the jobs you want to land. If you’re not sure, look up a few job postings that excite you and see what they’re looking for. Your resume should align with those requirements. Turn the tasks into resume bullets. This is probably what will take you the most time, but force yourself to work efficiently and don’t overthink it. Strong resume bullets include examples or metrics when possible, and answer the “so what?” by demonstrating how the task fits the big picture. If you’re having trouble writing bullets, try this quick trick. Once you’re done adding your new bullets, don’t forget your skills section! If you’ve picked up any new skills or worked with any new programs in your most recent job, add them in. If you’re in the first 10 years of your career, your resume should be on one page (here’s why). Adding your most recent experience will most certainly knock your resume off that single page, so this next step is about getting it back on there by cutting ruthlessly! I can’t tell people this enough – when recruiters are spending an average of 5 seconds reading your resume, less is more. Help them focus on the stuff that matters the most! Remove anything old or outdated. If you’ve been working full-time for a few years, you can remove old internships, babysitting gigs, or even campus activities. Check for relevance. 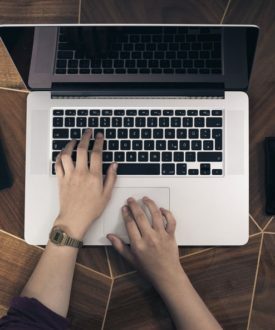 If there is a role on your resume that is part of your work history, but not very relevant, there is no reason why you need 5 bullets devoted to it. If it’s the oldest thing on your resume and not relevant, you can also consider just leaving the title, company, and date range, and skipping the bullets altogether. Uses consistent font type and sizes: Unless you’re a graphic designer, I strongly suggest keeping things simple. I never recommend having more than 2 font types or colors on a resume. Differentiates things like company names and job titles: I usually recommend bold for company names and italics for job titles. In case it’s helpful, I’ve been using the font Avenir for many of my clients – it’s easy to read, yet has a modern and fresh feel. For really traditional/formal fields, Times New Roman or something similar will do the trick. If you want to go with something more designed, I suggest buying a nice looking template like the below. Last but not least, never sacrifice actually describing what you’ve done (with well-written bullets) for a design element. The main purpose of the resume will always be to help the person on the other end understand your professional experience. Even good looks can’t beat that! 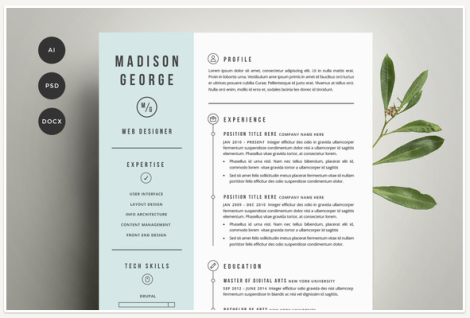 Here’s the honest truth… most resumes don’t end up in the no pile because they’re more than one page, or because they look sloppy, or even because of a minor typo (yea, I said it!) Most resumes end up in the no pile because the person’s experience is NOT right for the job. Plain and simple. For this step, I want you to put your recruiter/hiring manager hat on, pretend you are the one screening for the job you’re applying for, and ask yourself, “If I didn’t have any context other than this piece of paper, would I call me?” If the answer is no, consider why not. Are you missing some of the experience they’re looking for? If so, add it. Is there a skill you don’t have? Go get trained in it! There is NOTHING wrong or dishonest about customizing your resume to a specific job as long as you’re not lying about what you’ve done. Run through your resume with a fresh set of eyes and instead of sharing your experience overall, make tweaks so you are sharing your experience that is the most relevant to the job. Maybe you only help with event planning twice a year on a volunteer basis. However, if that is something you want to do in the future then it should absolutely make it onto the resume. Woohoo! You made it to the last step and it’s an important one. Print out your resume and do a slow, line by line proofread. Correct any typos or inconsistent formatting, and reword things as necessary. I actually recommend putting a little time between the writing and proofreading part as that will help you approach with a fresh perspective. If you have some helpful friends or family members, get their opinion. I often notice that people write their resumes so technically that it becomes impossible to actually understand what they’ve done if you weren’t there. And guess what? The person screening your resume wasn’t there either! That’s why friends and family can offer such a valuable perspective. Last but not least, always PDF the final version before applying or sending. You want to make sure this document looks consistent regardless of who opens it and on what type of device. Well, that was a lot! But if you go through these 5 steps, you are going to have a killer resume and you will have thought about all of the most important things. Happy updating!